Library bookshelves virtually overflow with “retellings” of Native American traditional tales “adapted” (stolen) by non-Native writers who then profit from something that’s intrinsically Muscogee, Lakota, Tsimshian -- something that’s not theirs to share. You may know that’s an abuse of tribal intellectual property, and that many Native nations now safeguard their traditional stories so that they (or many of them) can’t be shared with the general public. After so many of these stories were collected and disseminated without permission by non-Natives, keepers of the cultures created policies to stop the theft. Some stories are not to be shared, even among people of the nation that holds them, except in special circumstances. That statement, “This is an original story” and the detailed author/illustrator information may be part of the reason the Library of Congress designated Devil’s Club a “best practice honoree” in 2017. Readers can feel assured that the book’s Tlingit creators are NOT sharing a sacred or protected part of their culture. The story starts with a sickness in Raven’s village. The shaman they look to for healing is nowhere to be found. Raven discovers that a terrible giant with a spiked club is kidnapping shamans. He tells his people that he’ll stop the giant – but then falls ill himself. He tells his niece that she must take over for him. Raven’s Niece does her best to defeat the giant, but her plan fails. To escape, she jumps off a cliff – and finds herself among the Thunderbird people. Like her people, they are ill and missing their shaman. Their leader says they will help her. He drapes his Chilkat robe around her shoulders. The robe turns her into a Thunderbird. She finds the giant, shreds his deadly club, and drops him into the ocean. The voice of the Thunderbird clan leader boomed in her head. She spread her arms outward, but they were no longer arms. They were the wings of a giant bird -- they were the wings of a Thunderbird. Micheala Goade’s illustrations make dramatic use of color and line. Goade works in water color and India ink, then adds some digital elements. The end papers feature a misty green forest with black line drawings of large-leafed plants in the foreground – foreshadowing the arrival of something new in this ancient landscape. Raven is given a soulful expression that suits him in this incarnation. The giant and the Thunderbird people are depicted with the suggestion of traditional Tlingit formline designs. 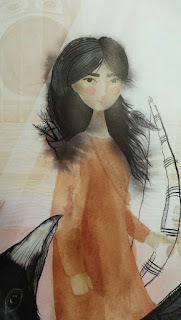 As for Raven’s Niece: the text doesn’t need the words confident, courageous, powerful and skilled to describe her, because the illustrations capture those traits. If you and the children you'll share Devil's Club with are not Tlingit, you’ll want to do some research first, to provide some background knowledge about where the story takes place and what Tlingit people say about themselves. Not being Tlingit, I may be missing some good resources to recommend here. But you can start by visiting the website of the Central Council of the Tlingit and Haida Indian Tribes of Alaska. There's more at the Chilkat Indian Village website. Also, you might want to look in your library for books with photos of devil’s club, the Alaska coast and temperate rain forest, and some traditional and contemporary Tlingit art. You might want to keep in mind that, although the Thunderbird is a popular image among non-Native people, it’s not part of every Indigenous nation’s heritage. Shaman is another concept that appeals to many non-Natives, but is poorly understood. Not all Indigenous peoples refer to their healers as shamans. If you've laid the groundwork by offering children tribally-specific information, they're less likely to generalize to all nations from this Tlingit story. I recommend How Devil's Club Came to Be. You can buy it online through Trickster Company or Sealaska Heritage Institute. 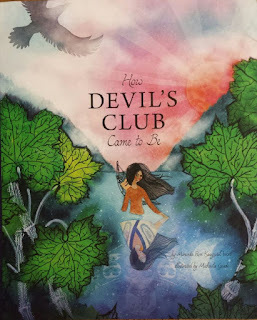 Note to Tlingit readers: I might have missed important points related to How Devil’s Club Came to Be. If that’s the case, we’d be grateful if you’d respond with a comment!